The Gunter’s Scale uses logarithmic and other scales to assist in numerical and trigonometric calculations. 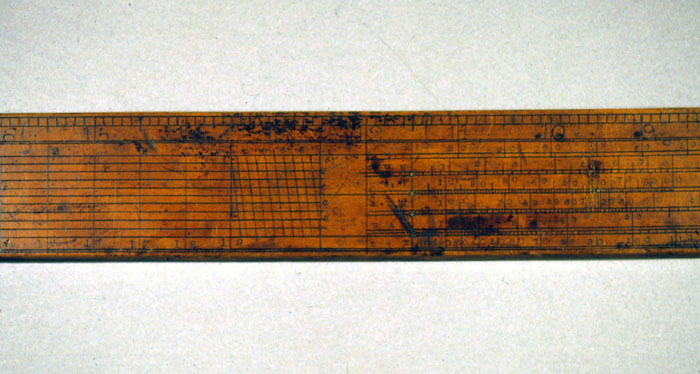 Instead of using a sliding scale like the later slide rule to assist in the addition or subtraction of logarithms, the user of a Gunter’s Scale uses dividers to mark sums and differences. 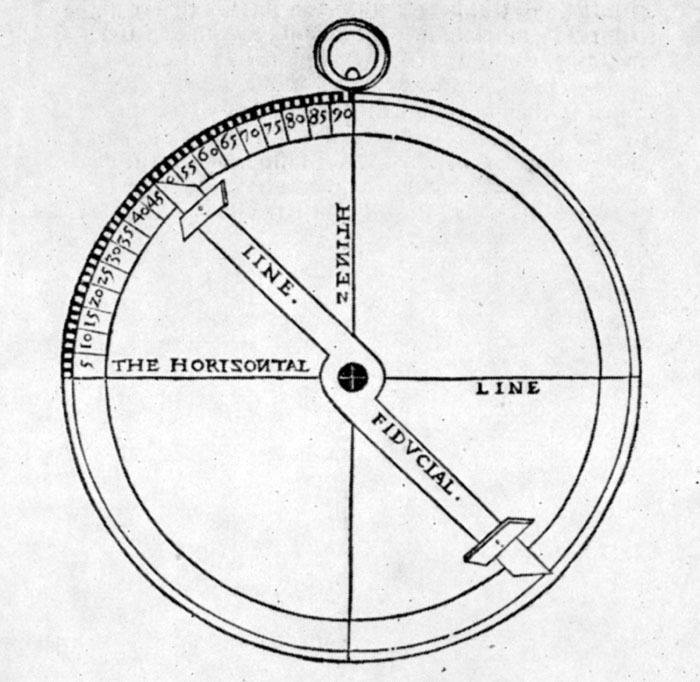 The Gunter’s Scale is particularly specialized for nautical use, as some of its scales make direct solution of dead reckoning problems relatively easy. 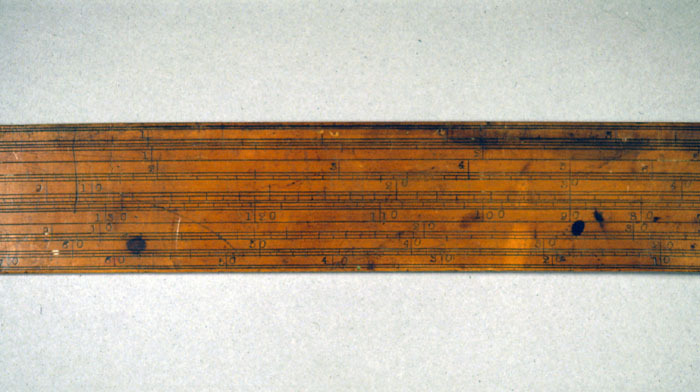 Developed by Edmund Gunter in 1623, Gunter's Scales or Rules continued to be made and used into the 19th century. 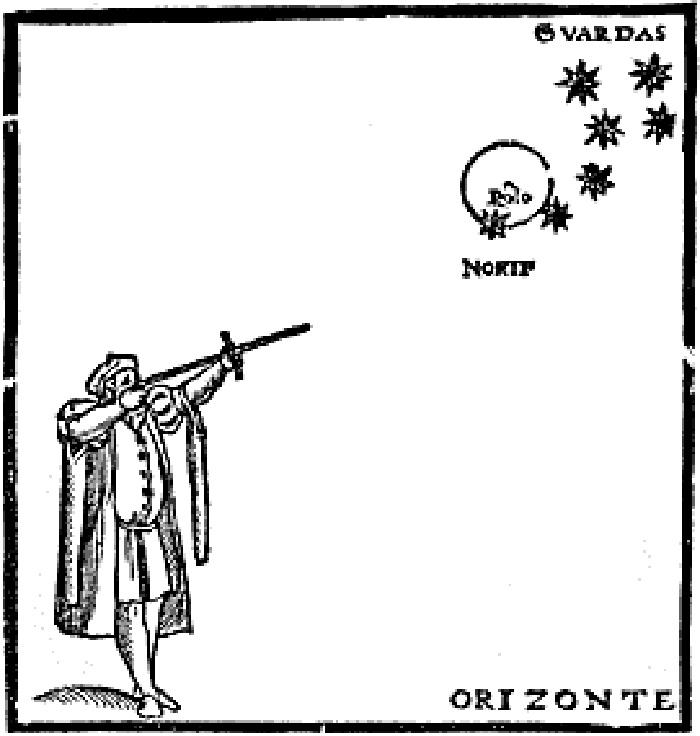 The cross staff measures the angle of altitude of the sun or moon or a star by sighting from one end of a staff, past ends of a cross piece, towards the horizon and the celestial object. The cross arm is moved up or down a graduated staff so that when sighting along the staff the user sees the sun or star and horizon at the ends of the cross arm. The altitude is then read off the staff. The altitude is measured on a scale along the staff. This illustration comes from Medina's Arte De Navegar, 1545. 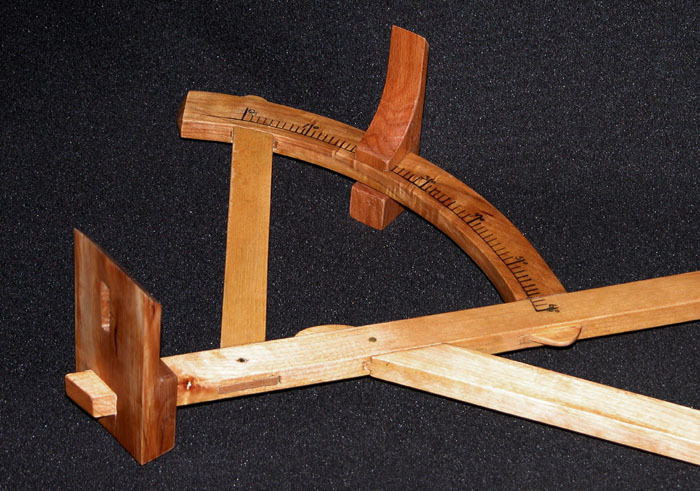 Working reproduction of a 16th century backstaff, showing the arcs and the vane for measuring the altitude of the sun. 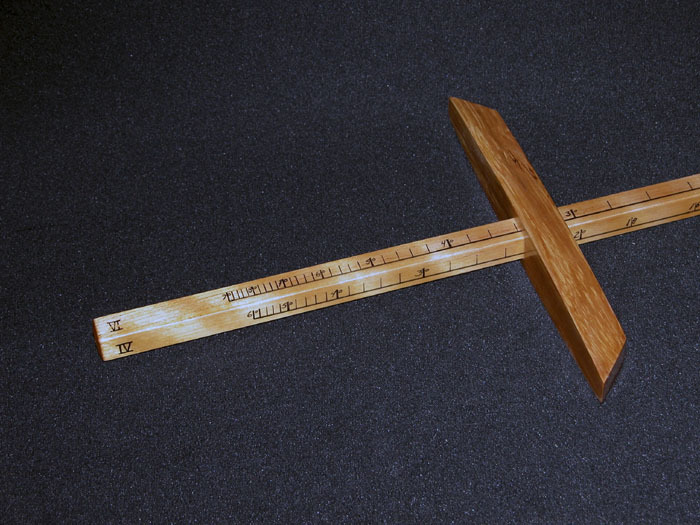 This working reproduction of a cross staff shows a scale along the staff and four different length cross pieces, so that different altitudes may be measured precisely. 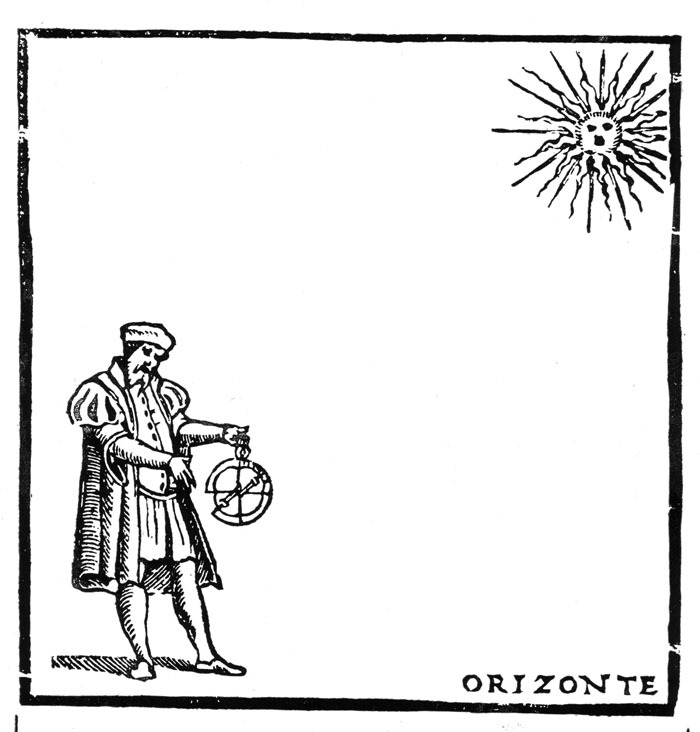 The height of the celestial body to be observed over the horizon determines which scale and arm is used. 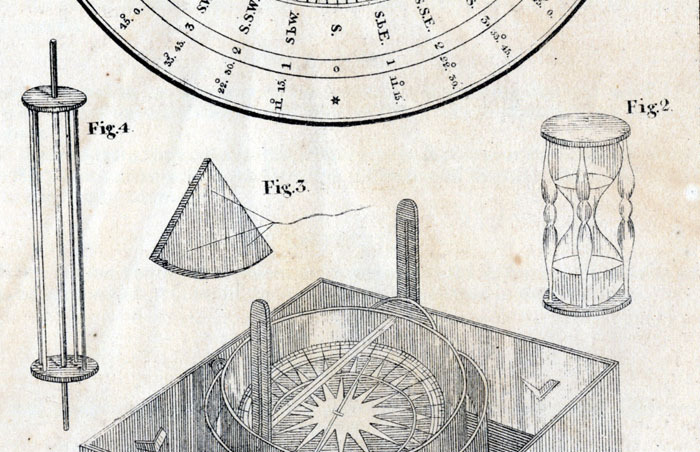 This classic image of using an astrolabe on shore comes from Medina's "Arte de Navegar," 1545. The navigator is letting the sun shine through the top hole on the sight onto the bottom hole. 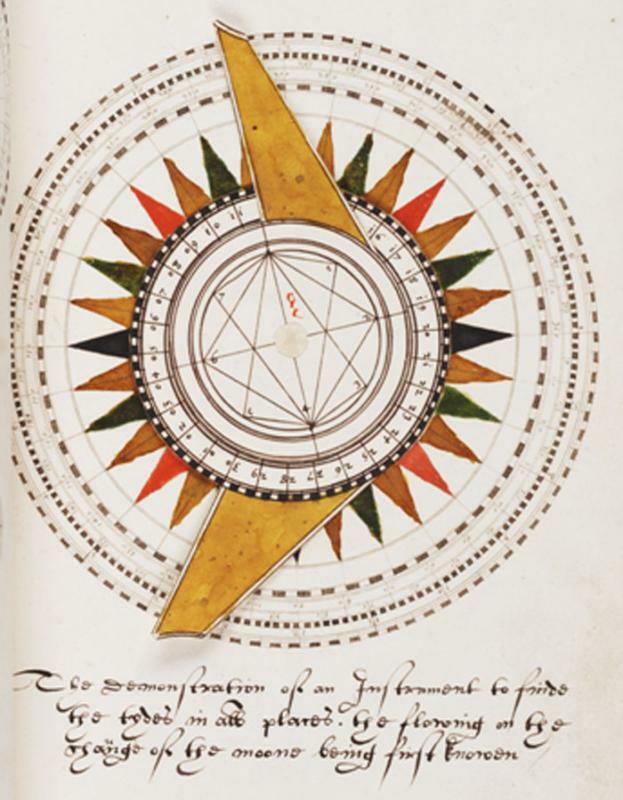 Drawing of an astrolabe from Medina's Arte de Navegar, 1545. 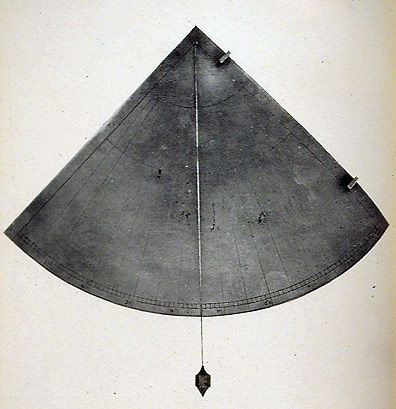 The seaman's astrolabe was a graduated ring or disc fitted with a sighting rule pivoted at the center. The instrument was suspended so that it hung vertically. 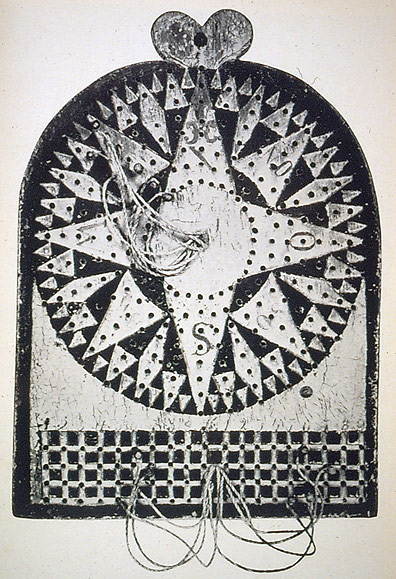 The user then turned the sighting rule so that the sun or star could be sighted along it and the altitude read off the ring. It dates back to ancient Greece and was heavily used in the Islamic world. The first records of a seagoing version date to around 1481. The chip log, a log line reel, and the sand glass used for measuring the speed of a vessel through the water. The chip is tossed, the sand glass turned, the line let out, and the number of knots in the line are counted until the sand glass empties. The number of knots that have passed is the speed of the vessel in knots or nautical miles per hour. This illustration is from Bowditch's New American Practical Navigator,1868, Plate VI.